Most people believe buying a foreclosed bank owned home is the ticket to automatic savings on their home purchase. Although there can be substantial savings on a foreclosures, it will vary by the home, neighborhood, city and even subdivision. The greater determining factor will be the condition of the property. Savings does not always equal value! While there are many bank owned homes in good condition, some have been stripped of major components, like the furnace, copper, air conditioning units, hot water heaters and some have been purposely damaged by the previous owners. I’ve definitely seen homes at opposite ends of the spectrum when showing buyers foreclosure homes in Indianapolis. We’ve seen entire kitchens removed, light fixtures gone, holes in walls, interior doors taken, water damage and mold growth. Some are just not a pretty site and others are horrendous. The asking price for a bank owned home may seem like a great bargain, but you have to consider the cost of rehab and then compare the total cost against the value of homes in the area. When you do find a great bargain, you need to know what your financing will allow. Homes with extensive damage or those missing major components can often be difficult to finance for home buyer’s using traditional financing. Banks don’t like the risk of financing homes that need too many repairs, especially when the repairs are directly related to habitability. You should also obtain an estimate of repairs, so you can budget for expenses. For big repairs, I recommend you invest in an estimate from a contractor if you are looking at a home with several repair items. If the repairs needed include electrical, plumbing or heating and cooling systems, you will want to have a good idea of costs with some hard numbers. Foreclosure homes can be a great value, but you must be prepared and know what you are getting into. Be sure to do your homework, know your financing and work with a Realtor who can help you determine the after rehab value of the home you want to buy. Your Realtor can also assist you in finding lenders who specialize in financing for a rehab. I absolutely agree. Most people want a *deal* and think that foreclosures are the way to go. They may overlook all of the repair and renovation costs that they require. Often you can get a resale for the equivalent of the foreclosure price plus necessary repairs. The word foreclosure does not necessarily equal a great deal in all cases. Yes, I think you're right. Many underestimate the cost to restore the home, and many of the elements you mention are VERY expensive to fix (well unless you are a roofer or a GC). Here in the Northeast/mid Atlantic, we also have the cold winter months to deal with and pipes freezing. And, I have seen lots of mold in homes that have been foreclosed. The big question is whether the actual cost of the repairs is less than the depreciated value and also if you can get 203K loan on it. (unless you have a lot of capital). Buyers some times over think the purchase of a home and forget the obvious. Private sellers in good standing with their mortgage company may (or may not) have equity in their homes and therefore can negotiate on the price. And a private seller may have ownership pride and be keeping the house in good shape. Banks have investors to answer to and appraisals on file. Buyers should keep in mind negotiation in mind. Buyers should also be educated about Real Estate being a long term investment. 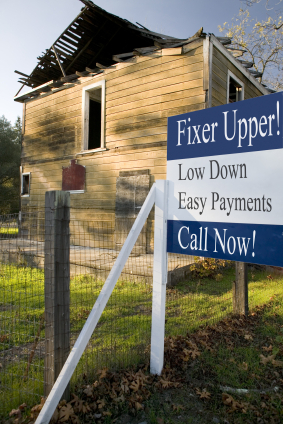 Flipping doesn't work like it used to and a lot of times buyers expect to buy, fix and flip. Just doesn't happen so much in this market anymore. I would also have to agree. A couple friends of mine were in the process of buying their first home and were looking into some foreclosed properties, which wasn't a bad idea...at least it seemed to be at the time. Once they found out that several of these foreclosed homes were just in terrible shape, they had decided to go another route and just out right buy a new home. Not to say that there are not good deals with foreclosed homes out there, but it seems to be very few and far between.